The renowned architectural critic Ian Nairn recorded in his 1961 essay about Marylebone that at the heart of the district, one he called ‘terribly civilised’, stood the Listener magazine. The fact that the area is now prominently home to Monocle seems to exemplify a shift. Although I’ve never lived in that part of London, I was a sort of blow-in, in that I worked from late 2009 to early 2015 in a language school on Manchester Street, one which bravely hung onto to a very marketable location for some years but has recently been forced out by rents in the region of £100,000 a year. It’s customary to think of Marylebone as well-heeled and genteel. It certainly has a character, albeit not one that I particularly identify with. In any case that character may be getting killed off, written out of the script. Chiltern Street is the centre of the gentility, with its reliably expensive wedding dress outlets, woodwind shops and hunting gear outlets, seemingly straight out of Jeeves and Wooster. It’s deeply Old Tory: patrician, leisurely, all tweed and creased leather. 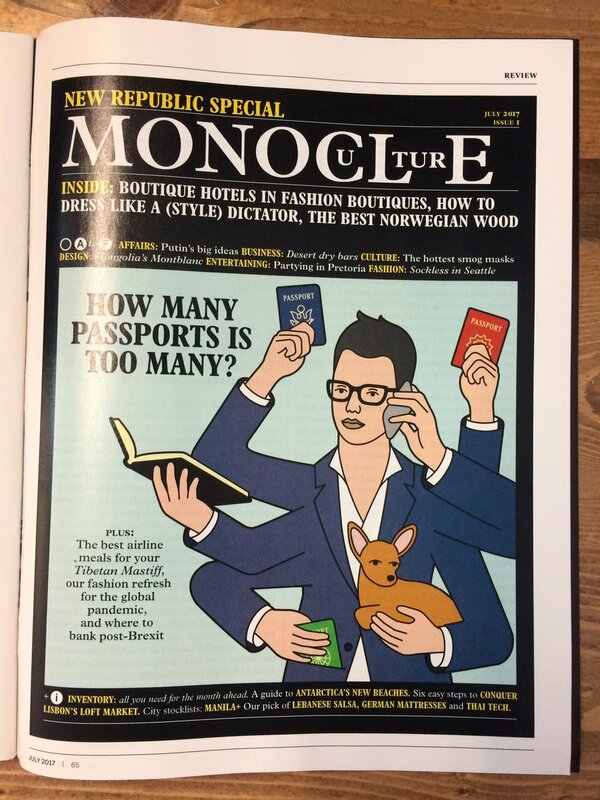 By contrast, the advent of Monocle with its neoliberal hipsters seems like a Viz parody of the ‘globalist’ worldview. (A typical cover of the magazine proclaims that ‘style has returned’ to wherever has been most crippled by austerity. It’s easily parodiable.) There’s also a bit of a walking joke striding around, in the form of Jeremy Clarkson, who seems to have a liking for an absurd gentrified pub called Gunmaker’s, one which is so salubrious it’s like an upper class person’s idea of a British local, bedecked in pristine union jacks and selling high-faluting sausage rolls and £8 scotch eggs from the Ginger Pig across the square . International money is buying into that image – or possibly buying it up. The anodyne ‘luxury’ new flats may be a sign that local Tory sympathisers are being priced out by people who don’t exist and therefore don’t vote. Significantly, the owner of our school was a personal friend of Jeremy Hunt, someone heavily invested in education-as-online-transaction, and David Cameron was seen trying to endear himself to the neoliberal gentry in the Chiltern Firehouse (maybe he was also a regular customer at the Ginger Pig…). The greasy spoon cafe Blandford’s went suddenly upmarket, in competition with the Nordic Bakery and various other healthier outlets catering to European eating habits. Then there are the chains which, rather as Karl Marx – whose daughter stood as a local election candidate – predicted, increasingly dominate: Pizza Express, Sandro, six or seven branches of Eat crowding each other out. In my time there restaurants and shops came and went in the space of a few months, due to the hurricane-like pressures of retail rents. It would be a tragedy if Daunt Books (on Marylebone High Street) fell prey to such forces. It’s one of London’s best bookshops, with its friendly and erudite staff. Although its selection of literature and poetry is almost beyond equal, it’s not the kind of place that has a section on critical theory or hosts talks by Ian Sinclair. It’s a long way from Hackney, more Alan de Button than Jeanette Winterson. The atmosphere is like Stanford’s, with its slightly late-19th century travel section. The fact that it is just up the road from the typically overstocked Oxfam and round the corner from the reliably excellent library is some indication of the local quality of life. An emblematic loss which my time in Marylebone bore witness to was the demise of the Tudor Rose. It combined the worst pub menu outside Scholar’s Pub in Rome with the kind of clientele who even Jeffrey Bernard might have turned his nose up at, including a landlord whose own alcohol consumption may have been the only thing keeping the place in business (not much of a business plan, it turned out, especially if you are also fond of the old gee-gees). It’s been replaced by the kind of place which is probably lovely if you can afford it. Although my colleagues insisted that Marylebone counts as central London, it always felt to me more like the west, peopled mostly by sloanes who rarely went east of Tottenham Court Road. The closure of a place like the Tudor Rose definitely moved it a few more inches in the direction of the setting sun. There was a sense of an uneasy coalition between old and new money. This LRB article details how the values of Theresa May are not the same as those of the neoliberal ‘globalists’. What the impact of Brexit will be on London no one can say. Britain will be more ‘open for business’ than ever before, which is another way of saying that everything of value will be for sale to all comers. As it happens, most of the time I spent working there I was living in Haringey, whose council is currently doing all it can to get rid of its human population and replace it with notional numbers on distant computer screens, or at least happy smiling computer-generated white people on vandal-proof billboards. Cycling back and forth between Haringey and Marylebone probably balanced out my life expectancy: in 2011-2013 there was a two-year difference between the two. Although that may have been levelled off by the fact that as I hit Euston Road, I passed through the area with the highest level of air pollution in the country. At least, thanks to Brexit, London’s contravention of EU clean air regulations won’t be a problem for very much longer. Anyone who thinks that bodes well for the local quality of life may well find that they’re whistling, or rather coughing, in the wind. Spot on assessment that. I worked on the High Street for 12 years and saw more ‘progress’ and ‘redevelopment’ in the timespan you mention than the previous 7 years, it was an instantaneous land-grab.The area was always ‘upmarket’ but now it’s the sole enclave of oily money and disreputable offspring. The Tudor was our local too, a rose amongst thorns in the ‘hood by virtue of Terry and Marie, now it’s as if it’s landed from a Parisian posh-nob-zone. Tragic. Cheers! Yes, Marylebone very much aspires to be the 16th arrondissement, with many posh cheeses and very few spam fritters. The Gunmakers is a surprise. If he goes to the Barley Mow on Friday night he’ll probably get mobbed by all the suits..